Angie Hendershot of ABC 12 and the Flint Diaper Bank. The Flint Diaper Bank sets a straightforward — yet bold — goal each year: to provide 1 million free diapers to the approximately 4,500 children under the age of 3 living below the poverty line in greater Genesee County. Since it was established, the Diaper Bank has made a profound impact the people it serves. And like many successful organizations, it has been strengthened by partnerships. Angie Hendershot, anchor and reporter with ABC 12 in Flint, was on assignment 10 years ago when she encountered a community resident who couldn’t afford diapers. A local shelter could only give her six at a time. “She had to try and make six diapers last for two weeks,” Hendershot said. Hendershot and colleagues at ABC 12 began organizing a yearly diaper drive to help meet the need. The yearly drives caught the attention of Phil Shaltz, a Flint area businessman and philanthropist, who had for years saved a magazine article about Joanne Goldblum, founder of the National Diaper Bank Network, wondering if something similar could be created in Flint. “I saw Angie leading diaper drives, and asked if she’d be interested in becoming partners and forming a nonprofit to see if we could take it to the next level,” Shaltz said. The Flint Diaper Bank was founded in 2013, with the intent to provide free diapers to children in need as a way to limit the stresses that a limited supply of diapers has on families. The organization fills a gap because no subsidies or state or federal agencies provide diapers to families living in poverty. Since its founding, the Flint Diaper Bank has provided more than 5 million diapers to children in the community. The Diaper Bank also has no administrative costs, so 100 percent of donations go toward purchasing diapers. Another partnership has helped the Diaper Bank continue to meet the need for diapers in the community. The Food Bank of Eastern Michigan provides warehouse storage space and through its network of nearly 400 partner agencies, assists with transporting and distributing diapers. “The Food Bank has the distribution arm, and they get a lot of requests for diapers from clients they work with, so it was a perfect fit for us,” Shaltz said. 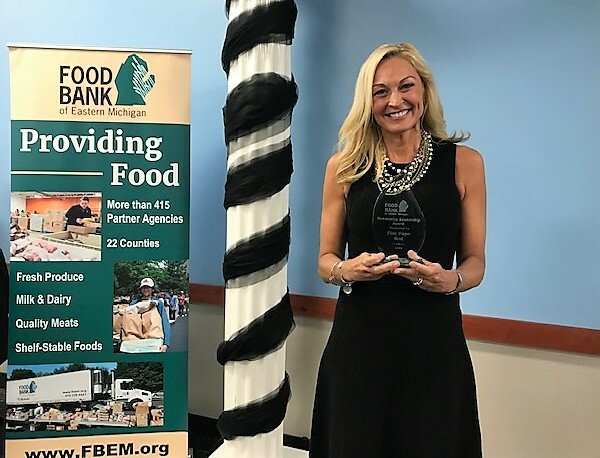 The Food Bank of Eastern Michigan recognized the Flint Diaper Bank with its Community Leadership Award at the Food Bank’s Annual Meeting on April 10. The Community Leadership Award recognizes individuals or organizations that exhibit exception community engagement that promotes the well-being of the Food Bank and its mission and programs in the communities it serves. Although the desired outcome would be for the need for diapers for families living in poverty to decrease, the Diaper Bank is focused on meeting that need. For information about the Flint Diaper Bank or to donate, visit www.flintdiaperbank.org. For information about the Food Bank of Eastern Michigan or to donate, visit www.fbem.org.